Now that the cold weather is here, we need to find activities to occupy our time in the evenings after supper. Friday night has typically been movie night for us. Wednesdays, we spend with my Mom. She picks us up in her mini-van. By us I mean, me of course, and my three granddaughters. We go to a fast food restaurant where the girls can play on a climber. They love spending time with Great Grandma. So three evenings are open. I've always kept an ample supply of craft supplies around the house. My granddaughters love making things. So do I. Naturally I decided to have a craft night. I haven't picked a night for it yet. I am thinking Thursdays. We'll see. So here is one of the crafts we worked on. About twenty-five years ago, I was into embroidery. I actually completed a couple of store bought kits, one project from a magazine and a few of my own creations. 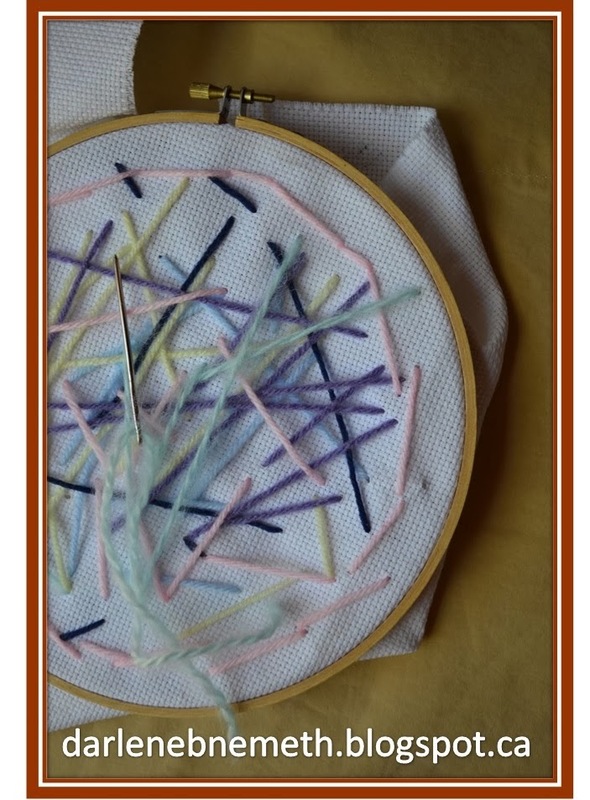 I liked embroidery and it was different than my usual drawing and painting. My little angels just might like it too. 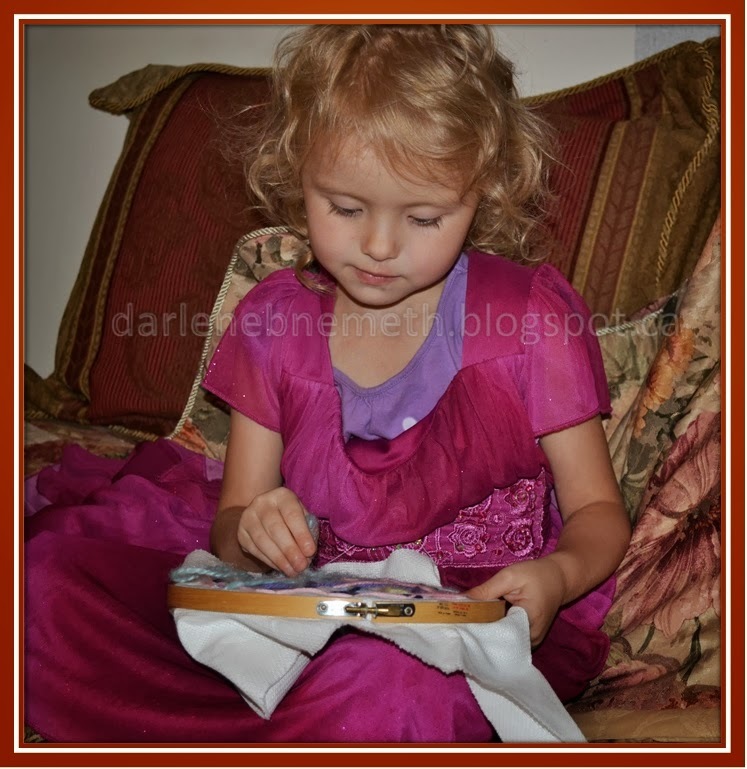 My daughter, Cole completed her own embroidery project some time ago and still had some supplies laying around the house. She had a couple of embroidery hoops and material. That was a good start. I had a couple of needles and lots of yarn. Yarn is easier to work with and it fills the space faster. A project was in the making. My granddaughter just turned five not long ago so I wanted to make this project easy - fun. I didn't want them to get frustrated and quit. So we made straight lines. They got to pick the colours of yarn. I asked the girls if I could take pictures of them with the embroidery. Honey Bunny and Sweetie Pie wanted to dress up like princesses for the pics. Sweetie Pie Posing For Her Pic. At first the girls had trouble figuring out which side of the material they had to push the needle through. I had to pull the yarn out a couple of times because they had it wrapped around the hoop. They worked on their creations for about a half hour. Not bad for their first time. 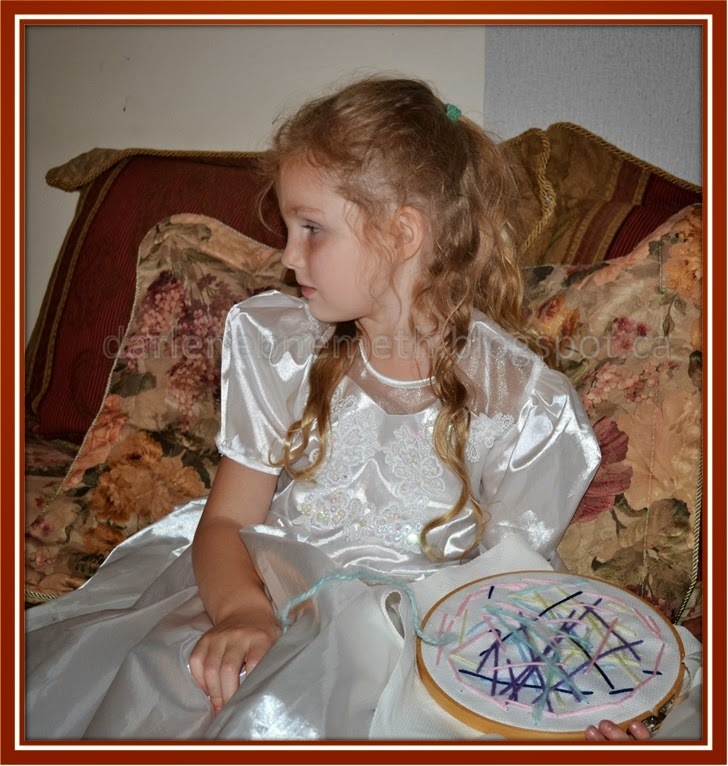 Honey Bunny wants to hang her embroidery up on the wall while still in the hoop. Honey Bunny said, "we could push this material to the back and it will look great. Won't that be a good idea Grandma?" Of course that would be a good idea. I asked her what made her think of that? She said, "I don't know. It just popped into my head." Craft night was a success. Well thanks for stopping by. I hope you enjoyed reading this post. 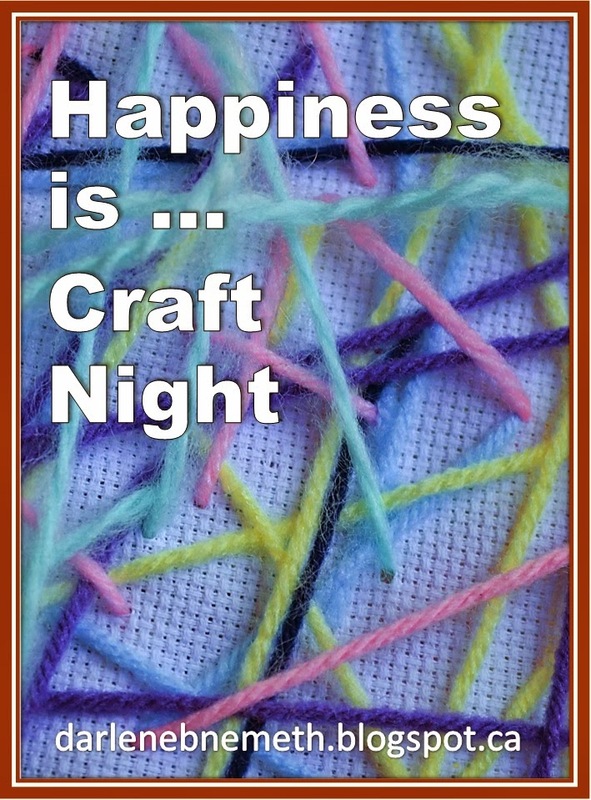 And maybe you are inspired to have a craft night too. And don't forget to stop by my Etsy Shop, Little Shop of Treasures or check out a few other posts. I look forward to reading your comments. Make my day and leave one!